It's no secret that Shasta Lake holds a big population of trophy trout such as rainbows and German Browns. Every year a good number of big rainbow trout in the 5-7 pound range are caught and the same can be said for the German Browns. 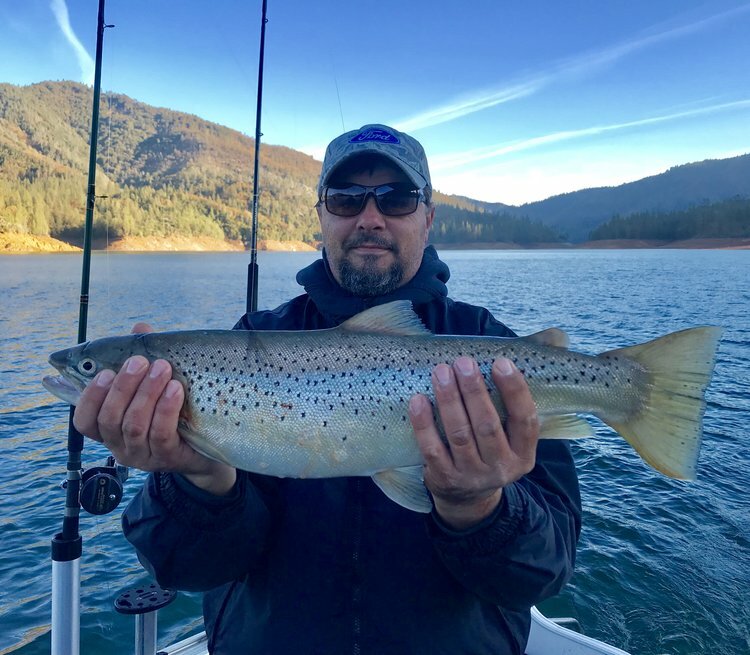 The chances of catching a big trophy size rainbow trout in Shasta Lake, especially in the summer months, is an everyday opportunity most months of the year. Trophy German Browns are likely to be more prevalent in Shasta Lake, but they tend to be much more elusive than the rainbow trout, making their presence a little less known on this popular body of water. 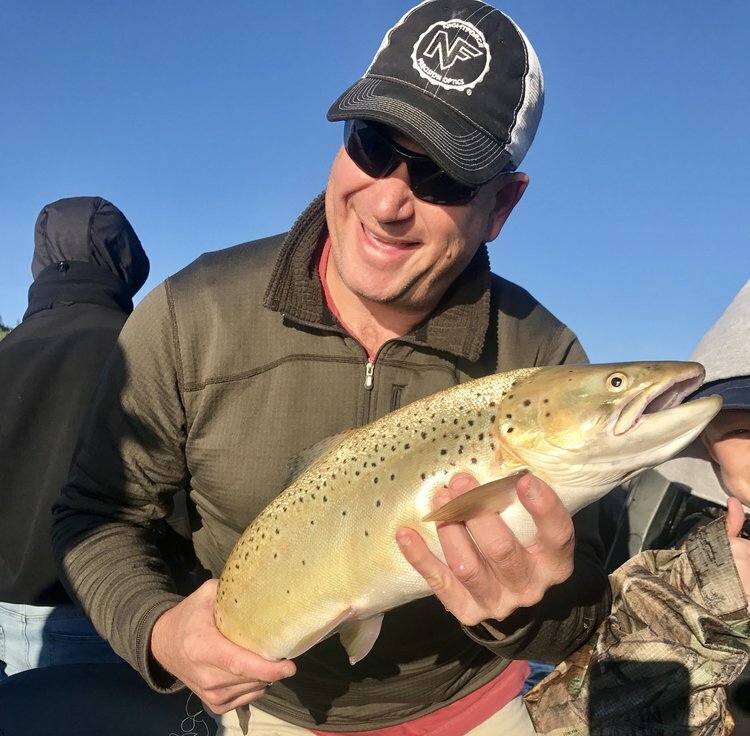 I don't claim to be the Shasta Lake trophy trout guru, but I have spent time talking with, and fishing with, men I would consider to fall into that category. That alone does not make me an expert, but it has helped me get some of my clients on some pretty impressive specimens in the 7 pound class. No 10 pounders yet, but with access to the Trinidad Tackle Optimizer Spoons, its just a matter of time. The most important piece of information I can express is trolling speed when fishing the Optimizer. These spoons are designed to catch big fish, thus the reason for their size and shape. These spoons are designed to be trolled above 3.0 mph and can be most effective when trolled at a speed of 3.8-4.0 mph. It doesn't matter if you are fishing at 100' or if you are top lining the Optimizers, the above speeds apply. Big fish expend valuable energy for bigger feeding opportunities, especially in the cooler months of the year. Just by looking at the pics in this article, it's clear that Optimizers have been proven to be worthy of their effort. The bigger trophy class fish don't typically swim slowly through their travel lanes, unless. Only when they are working areas holding balls of bait, or when they are holding on structure in an effort to ambush their prey will they remain semi stationary. These Optimizer Spoons are designed with bigger, faster swimming trout in mind and that's where their size and action comes into play. It's also a big reason why they are so effective when pursuing trophy class trout. Shasta Lake has two distinct periods where trolling depth has to be considered. The primary reason for this consideration has to do with water temperatures. In the early spring and fall months, Shasta Lake has cool water temps near the surface and during these times of the year, that's where I will be fishing. 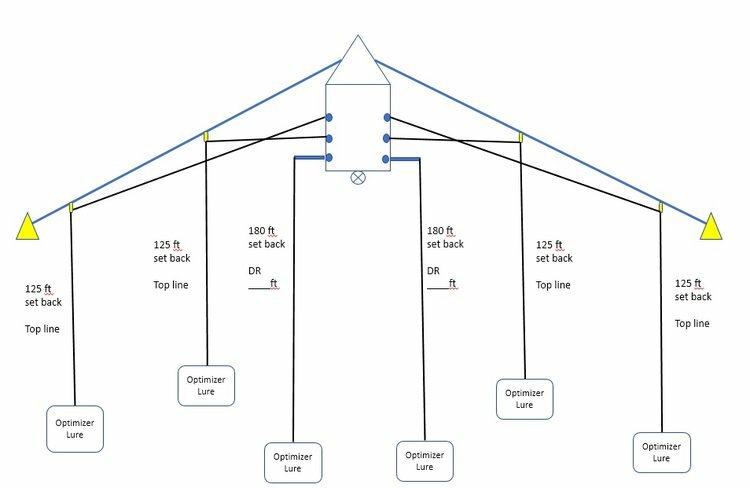 When fishing near the surface, I recommend the use of downriggers for fishing Optimizers below 15-20', but more importantly I recommend the use of side planers (see diagram below) when fishing at the very top of the water column. 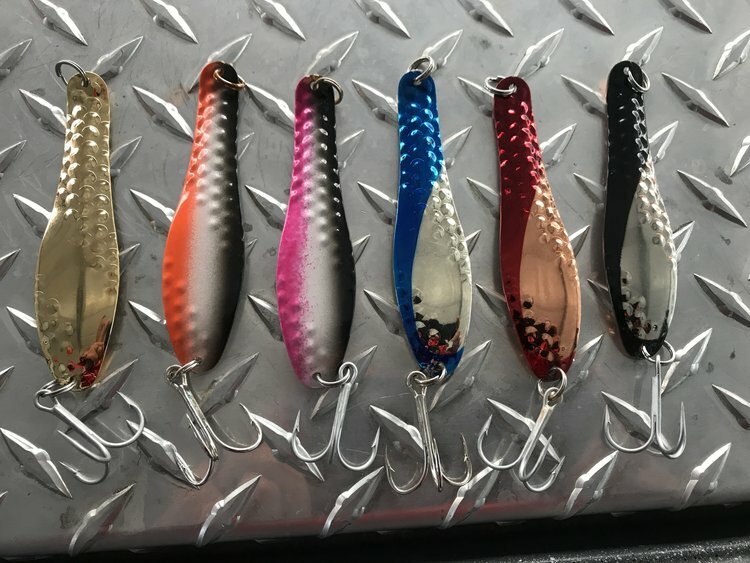 keeping your Optimizer Spoons off to the sides of the boat and not directly under when trolling at 4.0 mph can make a big difference when looking for big fish. These big fish are very weary and you're not going to get as many bites after blowing over them on the surface in your boat. Trout will typically dive and swim away from the sides of a passing boat after you troll over them. This pushes fish in your trolling lane out to the sides and into the path of your trailing Optimizers. Running your lines out away from your boat with side planers helps target un disturbed fish that are more likely to react to the trailing spoons. This technique is where the Optimizer presentations really shine and produce the most bites when fishing shallow. During the late spring and summer months, surface temps on Shasta Lake will increase continuously and the surface will be void of anything but bait fish and the occasional feeding trout and Spotted bass. The use of downriggers during this time of the year is absolutely essential. I started my 2017 trout season in July this year and the trout were at 45'. As surface water temps increased throughout the summer, I had to go deeper and deeper to consistently keep my clients on fish. By early October this year, I was fishing down to 125'. It's important when referring to the Trinidad Tackle diagram below to realize that the setbacks for the Optimizer Spoons are for the cold water months. You can shorten them up considerably during the deep water fishing in the summer. 125' setbacks with all your lines on downriggers down deep is an invitation for twisted and tangled lines during turns or when fighting hooked fish. 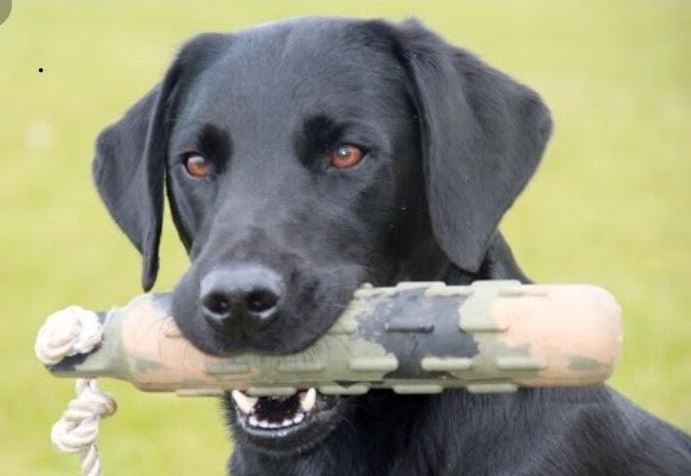 This can quickly take you out of the game and valuable fishing time will be lost dealing with tangled gear.